NASA-supported researchers are studying the complex physics of menacing sand dunes. Dec. 6, 2002: Next time you're at the beach or in the desert, climb a sand dune in bare feet on a windy day. Stand still in various places on the gently sloping windward side. Watch how wind-driven sand grains appear to jump an inch or two above the dune, stinging your ankles and making the dune's surface appear to be in constant motion ever upward toward the crest. 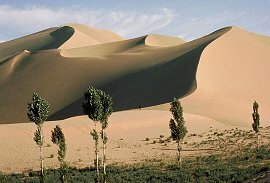 Above: "Singing sand dunes" of the Gobi Desert. A royalty-free image from corbis.com. More importantly, you've also just seen how dunes can migrate--a grave concern in nations where the relentless advance of desert dunes is a serious threat to habitation and agriculture. In arid northern China, for example, dunes are advancing on some villages at a rate of 20 meters per year. Parts of Africa and the Middle East are likewise threatened. How do you stop a moving sand dune? In some places people simply drench the sand with oil--it's effective, but not very good for the environment. Sand fences, like snow fences, can also help, although in many cases their design is little more than guesswork. Engineers are disadvantaged because there's no complete physical theory for the behaviour of these dunes. "Moving sand dunes are an example of granular flow--a poorly understood branch of physics," explains James Jenkins, a professor of theoretical mechanics at Cornell University. Above: This Landsat image reveals sand dunes advancing on Nouakchott, the capital of Mauritania. Physicists have long had neat mathematical equations that fully describe the behavior of solids like bricks, liquids like water, and gases like air. But granular materials like sand dunes don't quite fit in any of those categories. "Granular materials sometimes act like solids and sometimes like fluids," says Jenkins. "The transition from one behavior to the other can be very rapid." Gravel in the back of a dump truck, for example, sits virtually unmoving in a solid pile, even as the truck bed begins to tilt--until a certain angle is reached, and then suddenly it all tumbles downward in a thundering river of rock. Modern physics cannot predict the avalanche. Grainy substances are so hard to figure out because they're so complex. In a heap of unmoving sand, for instance, each grain interacts with five to nine immediate neighbors all at once. The transitional state, when the heap begins to move, is scarcely easier: Although each grain is simultaneously interacting with maybe only three to five neighbors, those are not the same neighbors from one moment to the next. Even a supercomputer can't keep track of all the interactions. NASA is supporting Jenkins' research to understand such flows. "Our work involves experiments, field studies, modeling, and numerical simulation of wind-blown sand," he says. "We're trying to understand the mechanisms of dune migration and what makes heaps of sand turn into moving dunes." It's all part of NASA's mission to understand and protect our home planet. Sand dunes fascinate Jenkins (along with his collaborators in Gainesville, Florida, and Rennes, France) because they manifest three aspects of granular flow. The first is saltation. "The word comes from the French sauter, meaning to leap or jump," Jenkins noted. Saltation happens above the gently sloping windward sides of dunes when grains are suspended in mid-air by turbulent puffs of wind, fall and strike the sand again, and then rebound and eject other grains--which then can do the same. "Under the right wind conditions, saltation can become a self-sustaining system of jumping sand grains moving along a dune," clearly visible as swaying patterns of sand about ankle height moving upward toward the dune's crest. Right: Wind causes saltation, or jumping grains, on the windward side of sand dunes. The second is sheet flows, an extension of saltation when the wind becomes strong enough that sand grains begin to collide with one another in mid-air. "In sheet flows, the mass transferred is extremely large," Jenkins says, in some sandstorms moving entire dunes impressive distances--up to tens of meters in a major storm, enough to engulf individual houses or roads. The third is avalanches of sand down the steep lee side of a dune. Together with sheet flows, avalanches allow an entire dune to move in a sandstorm "a little like a tank tread," Jenkins said, with sand particles continually circulating from the top to the bottom of the dune. Jenkins's goal is to characterize sheet flows and avalanches using partial differential equations that model the movement of sand grains as if they were particles in a fluid. "These equations should contain within them the way avalanches scale with viscosity, velocity of turbulent wind, grain diameter, and gravity," he pointed out. With such equations in hand, it might be possible to anticipate the onset of dune migration, to predict where they'll go and how fast. His goal is quite a challenge. Among other things, the exact form of an individual dune depends on the consistency of wind direction. If windblown sand comes from one prevailing direction, for example, a dune will be a crescent-shaped barchan. If winds switch direction seasonally--say, coming from the southeast for half the year and from the southwest for the other half--a dune will be linear. If wind direction is erratic, a dune may be star-shaped. Left: Alien dunes. 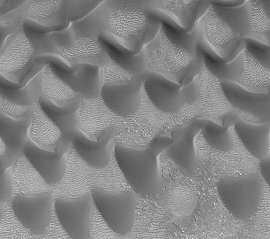 NASA's Mars Global Surveyor photographed these sand dunes on Mars. But the payoff may be significant. Not only might such characterization be useful in designing fences or other restraints effective at mitigating the advance of threatening dunes; it could also be a boon to planetary geologists. NASA's Office of Biological & Physical Research supports research, like Jenkins's, into the fundamental physics of grains. 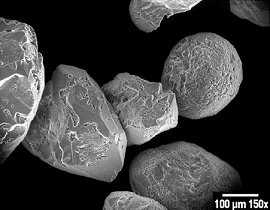 The Physics of Sandcastles -- (Science@NASA) An upcoming shuttle mission will carry small columns of sand into space -- and will return with valuable lessons for earthquake engineers, farmers and physicists. Particle Segregation in Collisional Shearing Flows -- a space-based experiment to study particle segregation in granular flows. more about dunes: How do sand dunes form? (University of Arizona); Sand Dunes on Mars (APOD); Canyons, craters, and drifting dunes: Earth vs. Mars); The Life & Love of Sand Dunes (DesertUSA) includes a fascination section on "booming dunes."